North Carolina’s unemployment rate shot up in August, as the state’s labor force continues to shrink. The state had 6.8 percent of its labor force actively looking for jobs in August, an increase from 6.5 percent the prior month, according to the monthly jobs report released by the N.C. Department of Commerce’s Labor and Economic Analysis Division. 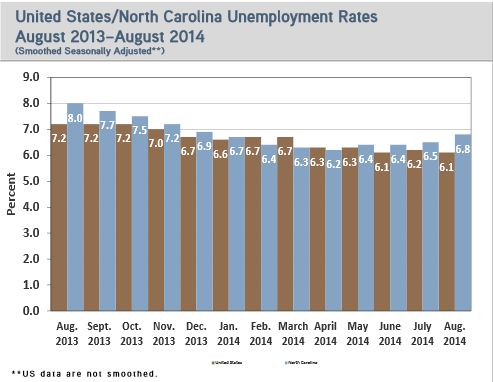 August’s unemployment, however, is still a big drop from the 8 percent unemployment rate North Carolina experienced a year ago, in August 2013. The jobs report (click here to read) also show that the number of employed workers dropped by 28,666 from the prior month to 4.34 million while the state’s overall labor force (which consists of those in jobs and those looking for jobs) dropped by nearly 20,000 to 4,66 million in a month’s time. Unemployed workers increased by more than 10,000 from July to August, but the 314,962 people looking for work in August. That’s down from a year earlier, when 372,467 North Carolinians were out of work. The state’s non-agriculture industries added 12,000 jobs. Government and education and health sectors saw the biggest jumps in growth in non-agricultural industries, adding 11,200 jobs over the last month, while construction and the hospitality sectors shed 4,400 over the past month, according to labor information. Some economists say North Carolina’s shrinking labor force is a sign that large segments of the longterm unemployed gave up searching for work after the state legislature, in 2013, pushed through changes to the unemployment insurance system that cut benefits for workers who lost jobs through no fault of their own. Others, including state leaders like Gov. Pat McCrory, have pointed to the drop in the state’s unemployment rate over the last year as proof that the controversial changes to the unemployment system and state tax cuts have bettered the state’s economy.